CSols new RFID labelling system speeds up identification and tracking for Histology Units using Formalin-Fixed Paraffin-Embedded (FFPE) Blocks. You no longer need to hand-write sample identification on tissue cassettes or use labels that you need to stick over waxy plastic surfaces or indeed use proprietary cassette writing equipment. CSols RFTrackIT lets you use modern RFID labels and detailed sample, sub-sample and location tracking that improves traceability and regulatory compliance. One or more FFPE blocks can be identified automatically using a handheld or flatbed RFID scanner. Their location can be tracked as the blocks are moved around your site. 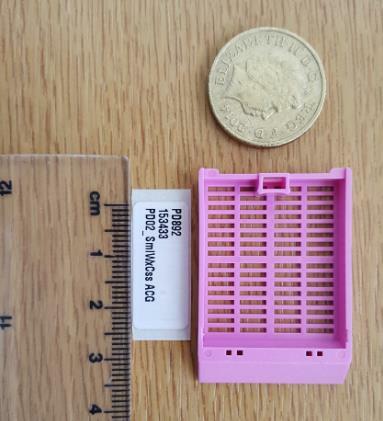 The embedded printed RFID labels contain unique specimen information as well as user definable information and of course when scanned, the RFID label opens up secure access to any information that you have stored against the block. FFPE RFID block tracking is in use across the UK Brain Banks Network and has also been the subject of poster sessions given by Tebbakha Riad at CHU Amiens-Picardie, service d’Anatomie et Cytologie Pathologiques, Tumorothèque de Picardie, place Victor Pauchet, 80054, Amiens, France. Click here to view the poster.